I can't believe how many years I spent with this fabulous book sitting on my shelf, sad, alone and ignored. summary An unassuming little mouse goes for a walk in "the deep dark woods" to find a nut to eat for her supper. Instead of finding a nut, she finds a number of creatures who would like to eat her for their suppers. Not wanting to be supper, Mouse creates a monster, a Gruffalo, "with terrible teeth, and terrible claw and terrible teeth in its terrible jaws" who likes to eat scrambled snake, owl ice cream and roasted fox. 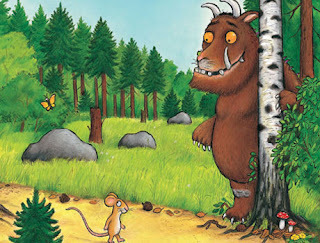 What a surprise for Mouse, when the Gruffalo makes an appearance in the woods, just as described by Mouse. 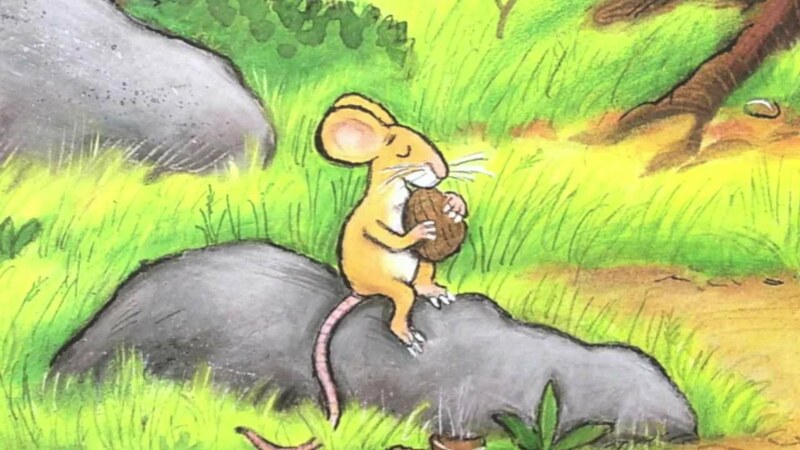 But the Gruffalo thinks that Mouse will be ever so tasty on a slice of bread. There's a fun twist in the tale - but my lips are sealed. 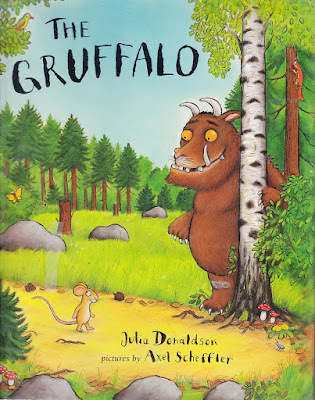 Julia Donaldson's rhyming text is lyrical. Every word is perfectly in the right spot. Axel Scheffler's illustrations perfectly capture the essence of the book. And the twist in the plot is brilliant. The book is always better than the movie - but the computer animated tv film based on The Gruffalo is amazing. 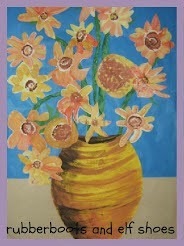 It was awarded a BAFTA nomination and won an Oscar for Best Short Film. Enjoy the trailer. Kids benefit from lots of oral language experience. So we are reading, rereading, telling and retelling. 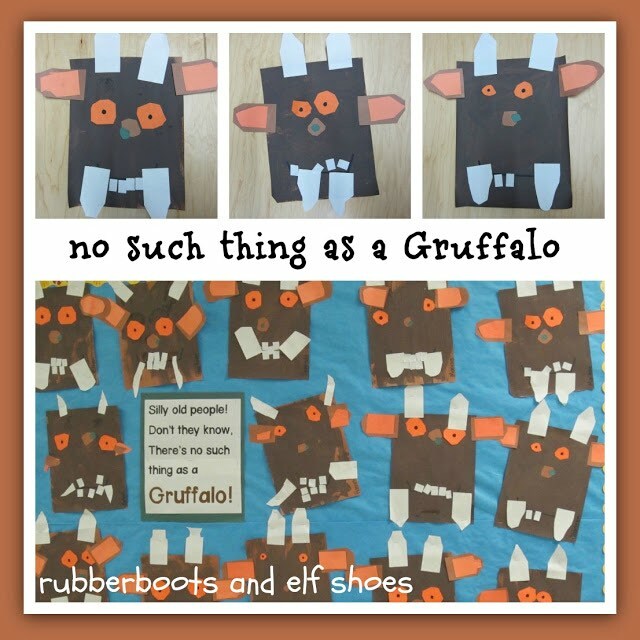 Sadly, these Gruffalo printable are no longer available online. Lucky you if you printed them when they were still available. I have hunted, but have not been able to discover why they were taken down. Luckily, there are some other great ideas and resources out there. The Official Gruffalo Website has some printable finger puppets. They could be used as finger puppets, or as cutouts for retelling the story. 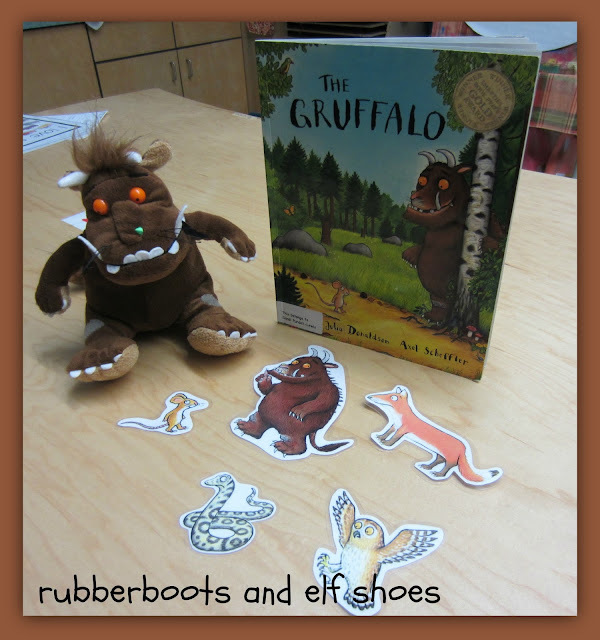 The Gruffalo Official Website has a variety of other printables to download and some online games to play. We made our own Gruffalos based on the idea at 2 Stars and a Swirl. 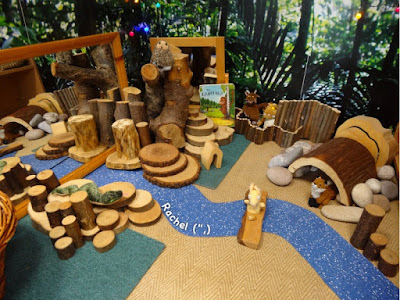 Stimulating Learning with Rachel created this "deep dark woods" for her students to replay and retell the story of the Gruffalo. 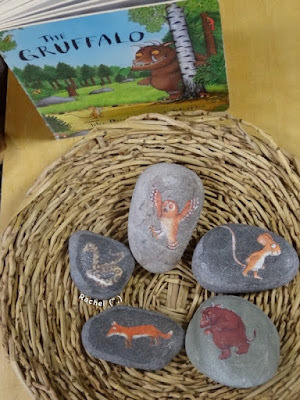 She created story stones for retelling the story. so that they could stand up in our small world play Deep Dark Woods. Aren't these Gruffalo and "friends" from The Feverish Feltist too cute for words. Awesome for a reader's theatre. 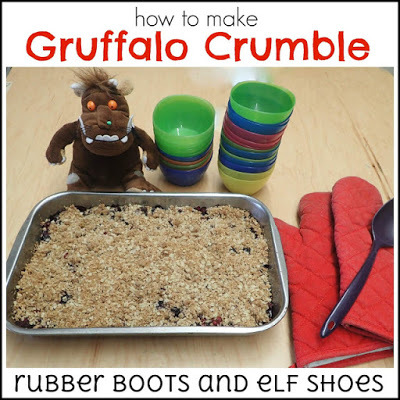 Make some Gruffalo Crumble - it's Mouse's favourite food! I *love* the Gruffalo! You're Gruffalo heads turned out cute. Thank you for sharing all these links! The stuff at Primary Treasure Chest is amazing!! I've never seen this book. I can't wait to find it. Great choice!Love this book, it is a great beginning of the year choice. Thanks for all the tips on resources. Did you purchase the felt story? 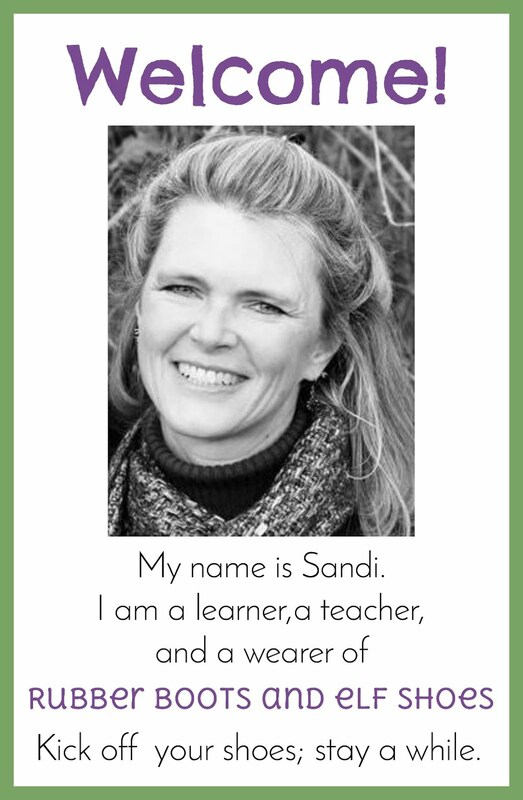 Great finds, Sandi. I love that book too, but like you, I haven't read it for a while! Thanks for the reminder. 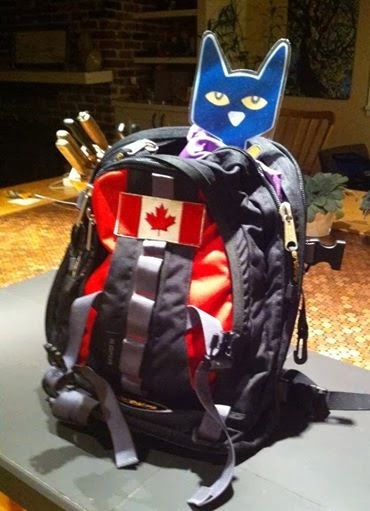 Thank you for mentioning my puppets in your post! It really made my day when I saw it. Your blog is really cool btw!